There are three categories of Walt Disney World Resort hotels: Deluxe, Moderate, and Value. Over the years, we’ve had the opportunity to frequent each of the Resorts in these categories multiple times. Each of the hotels within these three categories have their own benefits, and sometimes we find a few of the hotels that fit into more than just one of these categories. In our opinion, Disney’s Coronado Springs Resort is one such hotel that blurs the line between Moderate hotel and Deluxe resort accommodations. Disney’s Coronado Springs Resort opened in the summer of 1997 as Disney’s moderately priced convention center hotel. Out of the four Moderate Resorts at Walt Disney World, which also include Disney’s Caribbean Beach Resort, Disney’s Port Orleans – French Quarter and Disney’s Port Orleans – Riverside, Disney’s Coronado Springs Resort is the newest of the bunch, and in our opinion it is the moderate with the most amenities to offer its guests. The four Moderate Resorts are generally comparable in pricing, but at certain times of the year you may be able to take advantage of special offers and discounted nightly room rates at Disney’s Coronado Springs. Most often, we find the best nightly rates for Disney’s Coronado Springs are offered during the month of August. Located in the Animal Kingdom Resort Area, this is the only hotel in Disney’s Moderate category that offers convention services. 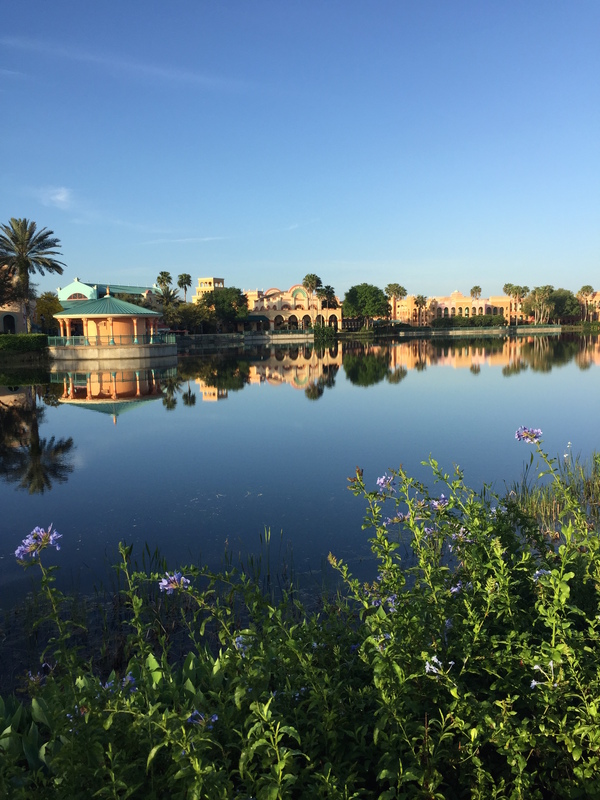 Like all Walt Disney World Resort Properties, Coronado Springs Resort is beautifully landscaped and transports you with its tropical plants and hammocks to a Spanish paradise. The Disney Horticulture Team does an excellent job of maintaining these well-manicured gardens with early morning cleanups that help maintain the overall magnificence of these lush themed grounds. The Resorts greenskeepers are extremely friendly, and they always greet us in the morning with a “Good Morning” and a smile. As guests of Disney’s Coronado Springs Resort, the Resort’s main building “El Centro” will be your first stop upon arrival for resort check-in. The official check-in time for the Resort is 3:00 p.m., however with the recent addition of on-line check-in for all Walt Disney World Resorts we’ve often found our room to be ready well before 3:00 p.m. This feature allows guests to check-in online via the Walt Disney World Website up to sixty days out from their arrival date. Along with guest services, El Centro houses a number of food and entertainment options. – A quick-service poolside bar and grill, Siestas Cantina, which serves a full breakfast as well as a lunch menu of small plates, sandwiches, beer and alcohol. The Resort offers spacious standard rooms and is the only Moderate Resort to offer suites. Each guest room is beautifully appointed in a number of different categories and locations as well as rooms with the option of two queen or one king bed. All rooms feature flat screen televisions, refrigerators, hair dryers, and iron with an ironing board. One difference worth noting between this Resort and the various Value resorts on Disney Property is the offering of an in-room work desk in place of the larger table and chairs setting offered in the Value resorts. For some, this is a plus considering that the workspace takes up less room and has built in outlets which can be easily used as charging stations. The various resort buildings throughout Disney’s Coronado Springs Resort are themed as Casitas, Ranchos, and Cabanas with a mix of Spanish and American Southwest architectural stylings. Each of these multi-story guest room buildings range from two to four stories high and each areas theme transports resort guests to a Spanish paradise without having to leave the sunshine state. The Casitas buildings are located closest to the Food Court, Health Club, and Convention Center. Many guests prefer this area due to its close proximity to the food court, and for this reason Disney offers an up-charge to your nightly room rate for the option of locking in a room in the Casitas buildings as a “Preferred Room.” If this is something you are considering, you can ask for more information about this offering when booking your Walt Disney World Vacation. We have had the pleasure of staying in the Casitas during a few of our visits to Disney’s Coronado Springs Resort in both Preferred and Standard room categories. The various guest room buildings of the Resort’s Casitas feature urban Spanish-style architecture. The short walk from your Casita to the Resort’s main lobby and food court transports you to a small Spanish village of intimate courtyards that are beautiful during the day and in the evening. Since the guest rooms at Disney’s Coronado Springs Resort do not feature balconies, the courtyards of the Casitas are the perfect retreat for catching up on your reading list, or just relaxing by one of the Resorts immaculate fountains. Moving counter-clockwise around the lake, Lago Dorado, the Resort’s next set of guest rooms are housed in the Ranchos buildings. The Ranchos buildings are the farthest set of guest rooms from the Resort’s main building and food court, however a few of the guest rooms in this section are not a far walk from the Resort’s main pool, the Dig Site. Designed with a Spanish-desert theme, these guest room buildings resemble pueblo-style architecture, and during our stays in these guest rooms we always feel as if we’ve relocated to the great town of Radiator Springs from Disney/Pixar’s film Cars. The final set of guest room buildings happen to be our favorite buildings – the Cabanas. We prefer the Cabanas buildlings since they are located adjacent to the Resort’s Main Pool. From the Cabanas it is just a short walk to El Centro. The Cabanas buildings also have their own private pool and laundry facilities. The only downside of the Cabanas buildings is that it is on the opposite side of the resort from the Fitness Center, Spa, Salon and Convention areas. However, we don’t mind the ¾ mile walk to the Fitness Center. There are a number of smaller quiet pools throughout the Resort, so you don’t have to go far to cool off on those hot Florida afternoons. However, the Lost City of Cibola Feature Pool & Dig Site is the resorts main watering whole. The pool features an aqueduct style pool-slide, an amazing replica of a life-like Mayan pyramid, and afternoon activities organized by the resorts Activities Crew (trivia games, campfires and a dance party are just a few of the family-friendly events that take place daily pool-side). – Siestas Cantina poolside bar and grill – which happens to be a favorite of ours! Each morning upon opening a pool-side ceremony takes place where water begins to flow down the Mayan pyramid’s massive steps, and the fun doesn’t stop at night! “Movies Under the Stars” are also shown nightly for Resort guests. These movies are on display pool-side, as long as the weather cooperates. Coronado Springs Resort is located adjacent to Blizzard Beach Water Park, and is just a short ride away from Disney’s Animal Kingdom Park, EPCOT Center, and Disney’s Hollywood Studios. The Resort features four bus stations throughout the Resort which allow guests to gain access to the rest of the Resort if they’re not interested in exploring it by foot as well as the rest of the Walt Disney World Resort Properties. If you’ve rented a car, all points on property are easily accessible, and parking options are available throughout the Cabanas, Ranchos, and Casitas. If you haven’t rented a car, no worries! Walt Disney World bus transportation is available at no extra cost to all Resort guests. The Walt Disney World bus system allows guests to gain access to each of the four theme parks without incurring any additional parking fees (which can become expensive at $17.00 per car/per day). What really sets this resort apart from the other hotels within the Moderate resort category is its inclusion of a 24 hour fitness center, a full service Salon offering hair, skin, and massage services along with a very popular dance club. La Vida Health Club offers three ellipticals, four treadmills, two stationary bicycles, and a whole host of free-weights and machines. Locker rooms are also available with restrooms, showers, changing rooms as well as regular and oversize lockers so you can workout hands free. A small lap / quiet pool is adjacent to the fitness center for those looking to take a post-workout dip. The use of the Health Club is free for all Resort guests. After 9:00 a.m. a full service staff is on site to answer questions or assist you with appointments for skin or massage services. Guests can gain entrance to the gym by using their Magic Band or RFID Room Key during the late night and early morning hours when staff are not present. We found the fitness center to be generally empty during the early morning hours (8:00 a.m. and prior) as well as in the mid-afternoon (1:00 p.m. – 4:30 p.m.). Throughout the day there was always cardio and weight equipment available for use. Casa de Belleza Beauty Salon & Spa is operated by the same management company who run the various spas on Disney Property, such as the Grand Floridian’s Senses Spa – Niki Bryan Salon’s. The Salon is located in the same building as La Vida Health Club and offers facial treatments, manicures, pedicures, make-up applications, hair styling, cuts, and color services. With its close proximity to the Health Club, it’s certainly tempting to enjoy a bit of pampering after an early morning workout! The official check-out time for Disney’s Coronado Springs Resort is 11:00 a.m., however if you’d like to take advantage of all the resort has to offer for a few extra hours, or you just can’t bear to leave this Oasis in the Sun, a late check-out can be requested through guest services by simply calling the front desk from your guest room or visiting guest services in El Centro. We often book late flights home in order to maximize our last day in the World, and therefore we’ve taken advantage of this offering on multiple occasions. The only time we’ve had difficulty with our requests being honored are during holiday periods when the resorts are filled to capacity. – During severe weather it’s hard to escape the elements and still enjoy all the resort has to offer due to a lack of interior corridors, which you would find at all of the Disney Deluxe Resorts. – Unfortunately due to its popularity as a convention hotel, many hotel guests have written this property off after saying they find it too crowded. We have had the pleasure of staying at this property on a number of occasions. The only way that we’ve ever known a convention was taking place at the resort was after seeing signs on display welcoming the convention guests or after it coming up in conversation with other hotel guests. We have never felt that these conventions have hindered our time at Coronado Springs Resort, or any other Disney Convention Hotel for that matter, in any way. Given the Resort’s massive size, it is difficult for us to imagine how this would be possible to do. We have stayed at other non-Disney owned hotels off-property, and during those visits we witnessed first-hand the impact of the poor planning of the hotel’s convention services upon its guests, but certainly never at Disney. With its mid-range room prices and deluxe amenities, Disney’s Coronado Springs Resort has easily become our favorite Moderate Resort on Walt Disney World Property. If you are looking for a Resort with similar amenities to the Deluxe Resorts, but at moderate prices, we highly recommend this Resort. Have you had the chance to stay at Disney’s Coronado Springs Resort or any of Walt Disney World’s other Moderate Resorts? If so, we’d love to hear your thoughts on the Resort!